A classic US industry! 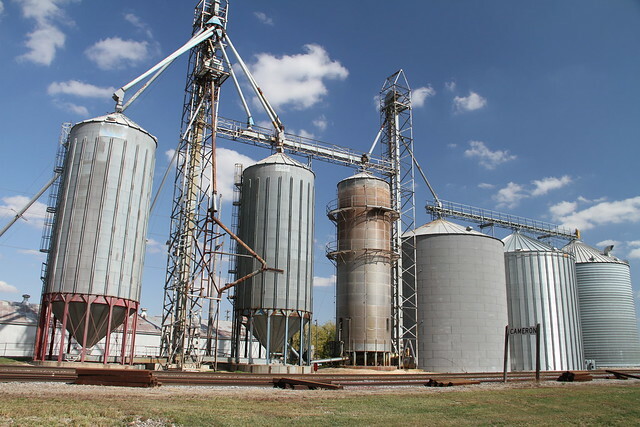 Please keep this thread for 'originating' elevators which primarily exist to load product, and not ones which are part of a larger industry like a corn processing or ethanol plant. Believe it or not that rusty ol' elevator is still a rail shipper, and various images (including Bing's aerials) show covered hoppers on the spur for loading. There are other shots showing MOW gear stored in there too which would be another use for the spur. The other (less modelling-friendly!) 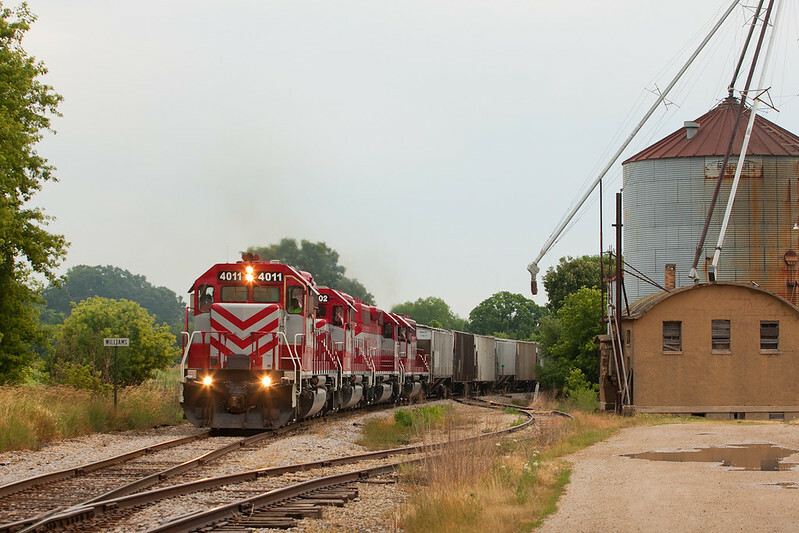 end of the scale is something like this - Western Grain Marketing of Adair IL, they have a unit train loading loop for quick and efficient loading of an entire grain train in one hit...it doesn't look too bad to model till you realise the loop can take a 115 car train! 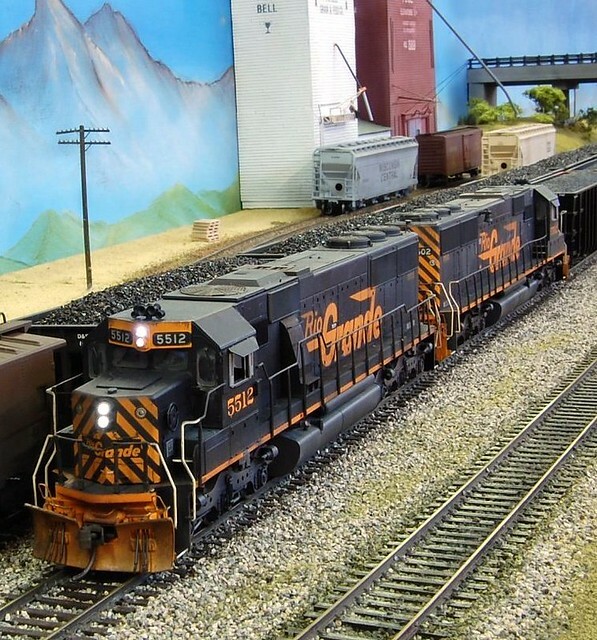 Their page on BNSF's website - showing capacity and a photo. Fascinatingly when you look up the location on Google maps it's there on the overheads, but hasn't been built yet on the streetview! Cameron is a common railfanning spot, being the place where the old Santa Fe line 'flys over' the Q on it's way west, and where BNSF built a new linking chord in it's formative years to allow trains to swap from one route to the other...so this elevator gets a lot of love as a 'photo prop' **Lots** of shots on Flickr either of the elevator, or with it as a backdrop. No understatement there! It wasn't clear how big it was at first until you compared the size of the grain bins to the truck trailers! 115 car trains WOW, thats a whole modular layout about twice over let alone a module. 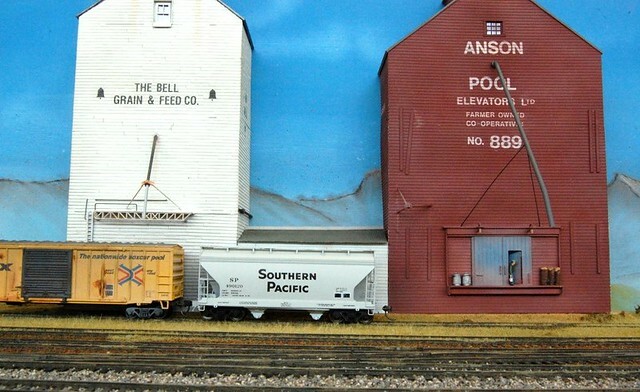 Here's the elevators that I put together for the Anson Yard layout; just semi-flats, made out of styrene sheet etc, following a study of the huge amount of pictures available on the web. On the Anson layout, they were alongside two stub-end tracks, with one serving each. They now live on Mike Hughes' home layout. A small elevator or two provides an excellent way to use a collection of interesting and colourful cars in a prototypical fashion. The brown elevator No. 889 also has some side doors that can be served by boxcars. Last edited by BrianMoore on Fri Oct 11, 2013 5:04 pm, edited 1 time in total. That is the kind of industry I was contemplating for my new 'to be build' module. 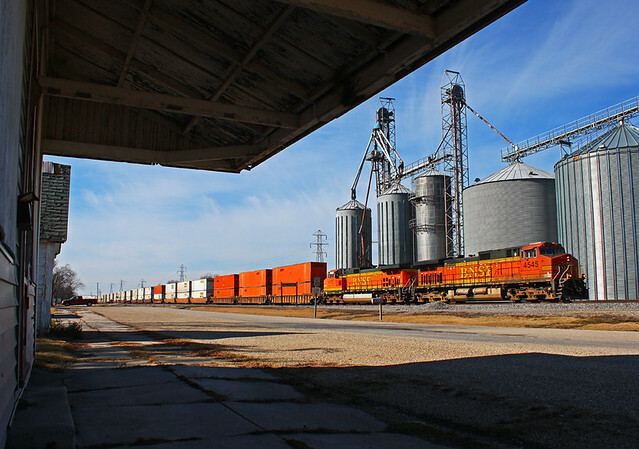 a grain elevator can add some operational interest to the module, with a related corn syrup facility at another spur. A small scrap yard is also amongst the contenders, but these have lots of character, and easy to build.